Whether you choose a handle set, lever, or knob for your entry door, you also need a deadbolt for greatest security. Adding a deadbolt to your existing lock is a fairly easy job, but you’ll be using two keys unless you buy the lockset and the deadbolt together. New lock technology like electronic keypads or biometric scanners are worth investigating, especially for apartments or workplaces where locks may need to be changed often. But traditional residential locks are either mortised or cylindrical. 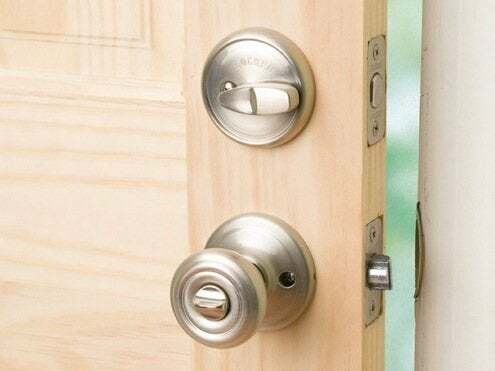 Mortised locks require a little more work and skill to install but tend to be more effective, especially the multi-point deadbolts that are mortised into the entire length of the door. Cylindrical locksets are more common, affordable, and easier to install; many doors come pre-drilled for them. Before you buy a lockset, you need to know if your door is right- or left-handed. From the outside, a right-handed door is hinged on the right. Also, note the door’s thickness and whether it opens into or out of the room. If the door is pre-drilled, measure the hole sizes so you can buy a lockset to fit.